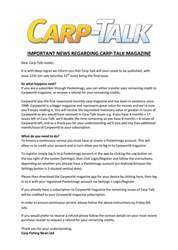 This week’s issue of Carp-Talk (issue 1038) is available to download now. This week’s catches are topped by a new Bundy’s Pit lake record for Dave Pagett, and a Cambridgeshire chunk for a man who is having a fantastic year, Myles Gibson. 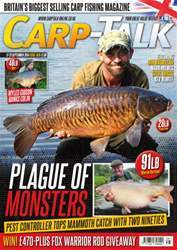 We’ve also got news of 90lb-plus commons and mirrors from Euro-Aqua, and a 48lb 2oz Wingham common for Matt Jones. 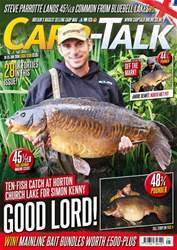 We look back at the Northern Carp Cup qualifiers and get inside the mind of Carp-Talk editor Simon Crow in “A-Z”, while Iain Macmillan spends a week at Les Quis. Kev Hewitt reveals why he only ever uses three rigs, Mark Holmes explains what his edge is for autumn, and Steve Briggs achieves a long-held ambition. 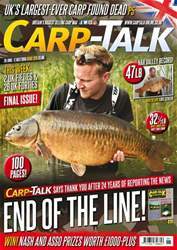 Products from Fox, Korda, DT Bait Developments and Sportviz go under the spotlight in “Trade Talk”. The Fox-Mainline Carp Angler of the Year competition continues and there are some Sportviz sunglasses and £470-plus worth of Fox Warrior rods to give away.